The Grand Theatre at Salt Lake Community College is inviting everyone to join them in a jukebox-style musical, featuring hit show tunes from the 1950s and ’60s. 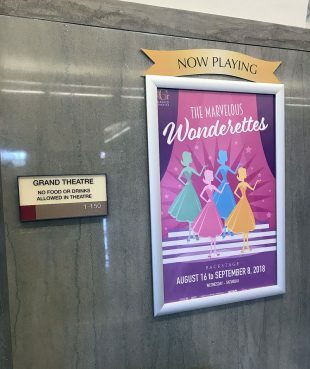 The Grand Theatre’s “The Marvelous Wonderettes” will continue in production until Saturday, Sept. 8. “The Marvelous Wonderettes” follows the lives of four ladies from their high school prom all the way through their 10-year high school reunion. Featuring long-time musical favorites such as “Mr. Sandman,” “Son of a Preacher Man” and “I Only Want to Be with You,” the story interweaves hit songs with the trials and triumphs of growing up for the four ladies. Director Jim Christian brings his musical expertise to a more intimate small stage setting with “The Marvelous Wonderettes” kicking off the Grand Theatre’s backstage concert series. The audience is invited to be seated right on stage as they are serenaded with classic show tunes. With the show being performed only a few feet from the seats, audience members are encouraged to interact and sing along with the music. The relatively small cast features the talents of Breezy Bassett, Britty Marie, Natalie Peterson and Emily Woods. This production allows for each member to showcase their voice and choreograph skills in an up close and personal performance the entire audience can enjoy. With an equal number of ensemble and solo performances the entire family will be able to decide which song and performance was their favorite, as well as most fun to join in on. “The Marvelous Wonderettes” will run through Sept. 8 and there is still plenty of time to grab a ticket for this one-of-a-kind musical. The show promises fun for the whole family and for people of all ages. “The Marvelous Wonderettes” will be the must see show to launch the fall season.